Mildred’s going on the road again! Along with dozens of other residents, Rader makes the most of Grace Ridge’s abundant and diverse travel opportunities – whether it’s taking in a Charlotte Knights baseball game, visiting Mayberry, exploring Charleston or cruising along the Saint Lawrence River. Later this month, residents and staff will explore the railways and music of West Virginia on a three-day motor coach with Christian Tours. Other field trips have included zip lining at Catawba Meadows Park, hiking in Pisgah National Forest and visits to Hatcher Garden and Woodland Preserve, Tryon International Equestrian Center and Dellinger Grist Mill. “Evelyn, her staff and the travel committee are always busy pulling strings, plotting, making plans and arranging more adventures for us,” said resident Byrd Cornwell, a frequent Morganton News Herald contributor. 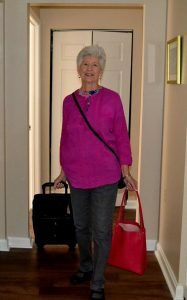 In early December, a group of 40-plus residents, staff and volunteers will head to New York City. On the way home from the Big Apple, the tour bus will pass through Washington D.C. to see the nation’s capital decorated for the holidays. For more information about traveling with Grace Ridge, contact Evelyn Beaver, life enrichment director, at 828-580-8328 or Evelyn.Beaver@blueridgehealth.org. Want to learn more about the benefits travel has on healthy aging? Read this white paper from the Global Coalition on Aging on Destination Healthy Aging: The Physical, Cognitive and Social Benefits of Travel and this Market Watch article on Travel that keeps the heart and brain healthy.